Mission of #LandmarkLendsAHand: To give back and be an asset in our community while promoting the common good of community service by volunteering with local non-profits. #TeamLandmark believes that serving our community is important. The act itself allows for our teams to display acts of service. To ensure that we are performing successfully, in 2016 we created a Community Service Committee. The Committee meets each quarter to plan for the events we will participate in. This allows our team members to have a voice where we participate and to strengthen our relationships with each other. Our company-sponsored initiatives show our employees, our residents (and the public) that we care about the greater good. Volunteering as an office or team is a great way to build on the culture developed at Landmark. These include working together, having fun, laughing and being kind to everyone. Landmark is taking company initiatives a step further and providing team members with volunteer paid time off which is a benefit that sets our organization apart in the industry. The main goal of our community service initiative, #LandmarkLendsAHand, is to strengthen our community relationships throughout our portfolio. Teams are encouraged to participate in service events year-round and there is an annual Volunteer Week for our teams to volunteer together. We have a long standing partnership with YouthLife and Sandhills Coalition for Human Care, annually we partner with Angel Tree, Giving Feast, Toys for Tots, Richmond Conexiones for a coat drive, school supply drive with Henrico Schools, and Move For Hunger where we collected over 3,000 pounds of food in September 2018, quarterly we have a blood drive for VA Blood Services, work with FeedMore’s Backpack program, and have adopted a street with Keep Henrico Beautiful, and weekly we have a team of two to deliver Meals On Wheels. Since 2016, #TeamLandmark has volunteered over 1,547 hours, given over 100 pints of blood, donated over $55,000, and collected over 5,000 pounds of food. In this time, we have strengthened our relationships with our team and have made an impactful change in our community. It’s not only the customers that make up our community. Other businesses, local government, and neighbors all take note of how active a company is in the community. Despite the presence of the internet, the health of a local community greatly influences the well-being of the businesses within it. Community service not only creates goodwill, it can improve a business’ prospects and employee recruitment by making the area a better place to live and work. In 2018, #TeamLandmark has volunteered over 515 hours, collected over 3,000 pounds of food, donated over 100 pints of blood, and donated over $20,000 to the organizations listed below. In addition to volunteer work, in 2017 #TeamLandmark established the first community garden in our portfolio. Community gardens are communal green, open spaces where residents gather to garden together. 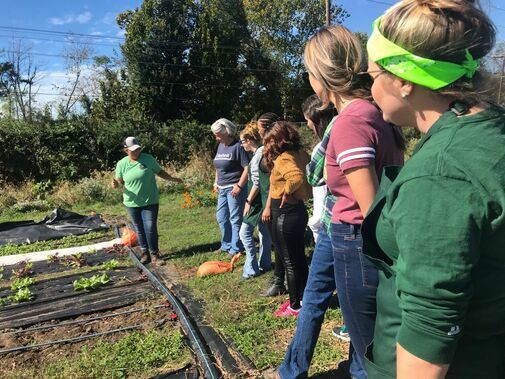 These gardens enhance the quality of life in area neighborhoods in many ways, while providing a place to learn and share gardening with others. Community gardening improves people’s quality of life by providing a catalyst for neighborhood and community development, stimulating social interaction, encouraging self-reliance, beautifying neighborhoods, producing nutritious food, reducing family food budgets, conserving resources and creating opportunities for recreation, exercise, therapy and education. The gardens are available at no charge to residents and is a first come basis with a contract agreement. As of now, we have three community gardens in Richmond and plan to expand to other cities in VA and NC. Brought on two brand new communities and had a successful lease up within 6 months. Took over management of three communities in Q3 2015 and increased occupancy to 95%. In that time, we have done multiple improvements to each community, including: landscaping improvements, paving and seal coating, new roofing, new signage, rehab units, new air conditioning, exterior painting, community garden, and 2018 will bring three new playgrounds, dog park, and a community garden. Increased revenue portfolio by 4.89%. Enhanced our star ranking on Google to 3.5 across the portfolio. Portfolio wide, we have increased our portfolio for HOA and multifamily services by 6%. What is a management company? What do they do and how do I reach them? A management company is contracted by the Board of Directors to provide such services as: Collection of assessments, supervision of subcontractors, obtaining bids for subcontracted services, providing financial statements and collection reports, as well as a general clearing house for problem solving, communications with homeowners and the Board of Directors and to serve in an advisor capacity. It is a non-profit corporation registered with the State and managed by a duly elected Board of Directors.